Diners and restaurants are becoming more adventurous with culinary fare, and in the last few years we have witnessed a rise in demand for game meat in Australia as well as overseas. Making increasingly regular appearances on our menus are: kangaroo meat, rabbit meat, emu, and boar just to name a few. 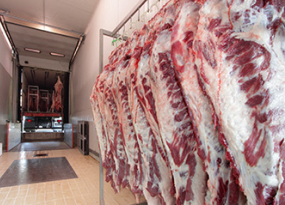 So with demand on the rise, a well-known and highly respected game meat processing company called upon A&D TechEng’s services to help improve their existing game meat tracking process, and to ensure they continue to deliver quality game meat of the highest standard to our domestic market as well as overseas. Facilitate better tracking of the animal from the truck to the cool room. Improve the current process of recording stock with greater accuracy and efficiency. Devise a catchment operating system for any barcodes that require manual recording. Reviewing the customer’s requirements with the assistance of A&D Partner Able Scales in Brisbane, and using barcode scanners, Schneider SCADA & HMI System, Allen Bradley Micrologix, A&D Weighing’s IP65 AD-4407 indicator with analogue output option, and utilising existing A&D overhead-track OHT-600 scales, the team were able to design and implement an innovative system that can easily read, record and sort information quickly and easily. The system registers the shooter ID tag and the weight of the animal using the digits on the barcode (the barcode primarily identifies the type of animal, site reference, the shooter), and additional information regarding the truck number, the date, and time is also collated into a CSV file for further accounting and reporting requirements. If any barcodes are not readable/visible in the tag reading area, then the animal is automatically diverted to an alternative weighing station where manual entry is performed. Faster and more intelligent weighing process, releasing extra labour for other tasks. An efficient recording and tracking process that requires less time to complete. Added peace of mind with improved accuracy and recording capabilities. Improved batch QA & QC reporting and accounting.